Obesity Rises As Poor Countries Get Richer : Shots - Health News One-third of adults worldwide are overweight. Globalization has made high-calorie foods readily available at low cost almost everywhere. In 1980, less than 40 percent of Mexican women were overweight. By 2008, almost 70 percent were. 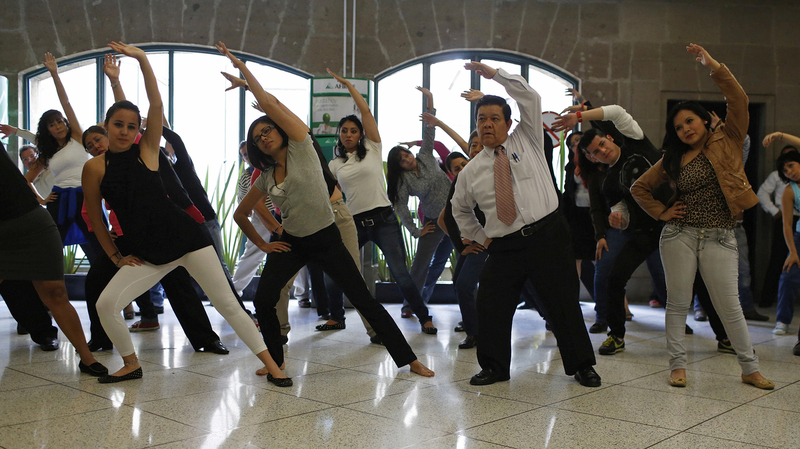 Government workers exercise at their office in Mexico City, August 2013. To counter the obesity epidemic, the city requires all government employees to do at least 20 minutes of exercise each day. People are getting fatter around the world. And the problem is growing most rapidly in developing countries, researchers reported Friday. "Over the last 30 years, the number of people who are overweight and obese in the developing world has tripled," says Steve Wiggins, of the Overseas Development Institute in London. One-third of adults globally are now overweight compared with fewer than 23 percent in 1980, the report found. And the number of overweight and obese people in the developing world now far overshadows the number in rich countries. "As countries go from being low-income to middle-income, and heading towards high-income, people earn more [money], and they can eat the foods that they find tasty," says Wiggins, who co-authored the report. Many foods people find tasty are also often the most fattening. Globalization has made high-calorie snack foods readily available at low cost almost everywhere. Take Mexico, for instance, which Wiggins calls a "poster child" for the global obesity problem. "If you walk into a Mexican village store," he says, "you'll be confronted with lots of tasty offerings of potato chips, nice cookies with lots of fat and sugar in them and lots of sweetened carbonated drinks — all kinds of stuff, which is terrific in small quantities, but not when you start to eat it in large quantities." In 1980, less than 40 percent of Mexican women were overweight. By 2008, almost 70 percent were. In some Pacific Island nations, more than 90 percent of men are now considered overweight. The Middle East is also seeing a boom in chubbiness. "It's something like 3 out of every 4 adult Egyptian women are now overweight or obese," Wiggins says. This rapid growth in waist sizes poses huge challenges for health systems, especially those that are already overburdened in poorer countries. Excessive consumption of fat, salt and sugar are "significant contributory factors to some cancers, cardiovascular disease and diabetes," the report noted. These diseases are costly to emerging economies, not only because of increased health care expenses, but also because of lost productivity. "It's a personal and societal problem of considerable magnitude," Wiggins says. Reversing this global trend, he says, could be accomplished with small changes to people's diets. In particular, public health campaigns could encourage families to substitute fruits and vegetables for high-calorie snacks. But, the report concludes, there's been little political will in developing nations — where workers are finally enjoying a bit of disposable income — to tell people what they should or shouldn't be eating.